We left Kathmandu in the early afternoon. 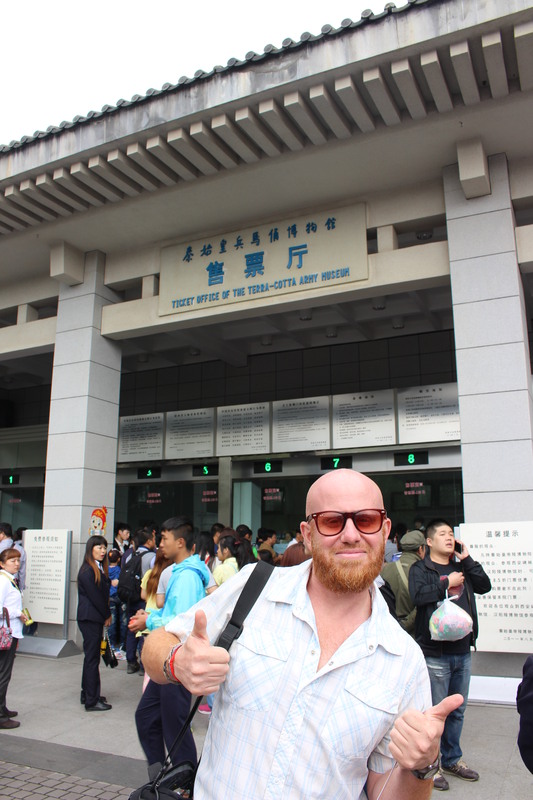 We knew we would be crossing the entirety of mainland Asia that day, but we were ready for it. After seemingly endless, hot and cramped multiday bus and train journeys across India we could handle anything. 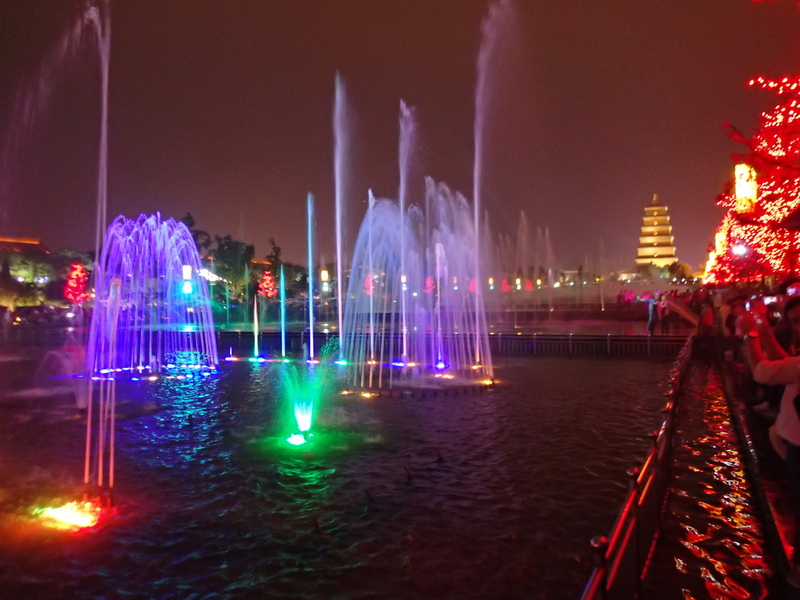 By early evening we were on our first flight, a three hour jaunt to Kunming. No problem. That was followed by a twelve hour layover in the airport. No problem. We found a restaurant that had closed for the night, sneaked in and slipped into a booth for a few hours rest. 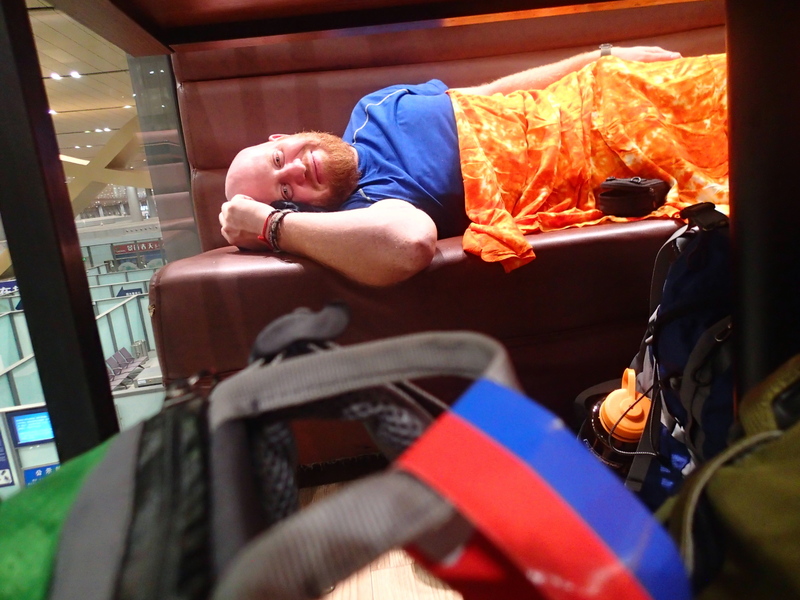 Sleeping in an airport restaurant booth. Classic L&D. After being awoken at 5:50am by morning patrons we jumped our next three hour flight to complete the journey to Chinas East Coast. Easy peasy. 24 hours after leaving our hotel in Kathmandu we reached our next destination. 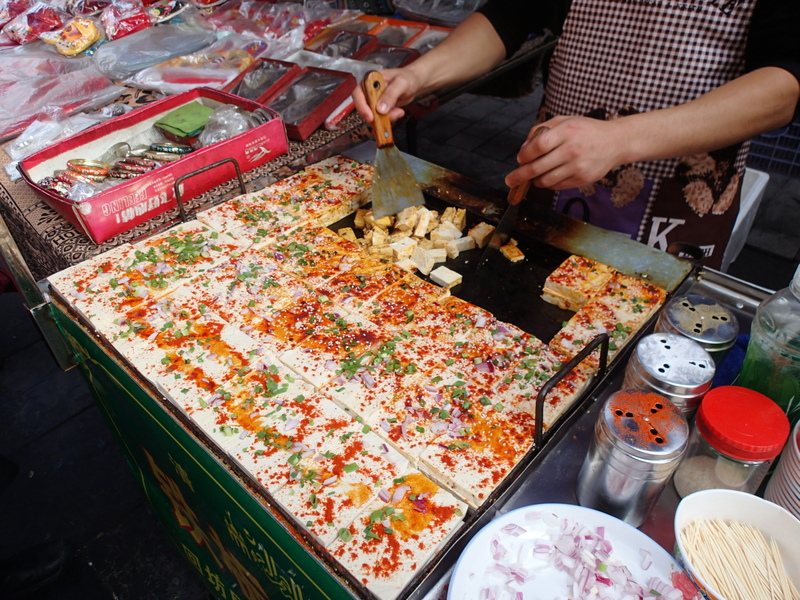 Xi’an, China. 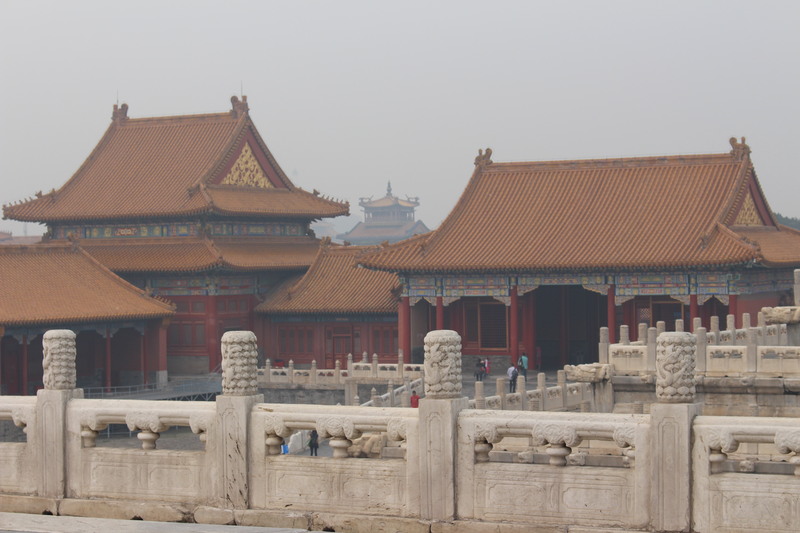 Home of the infamous Terracotta Warriors. 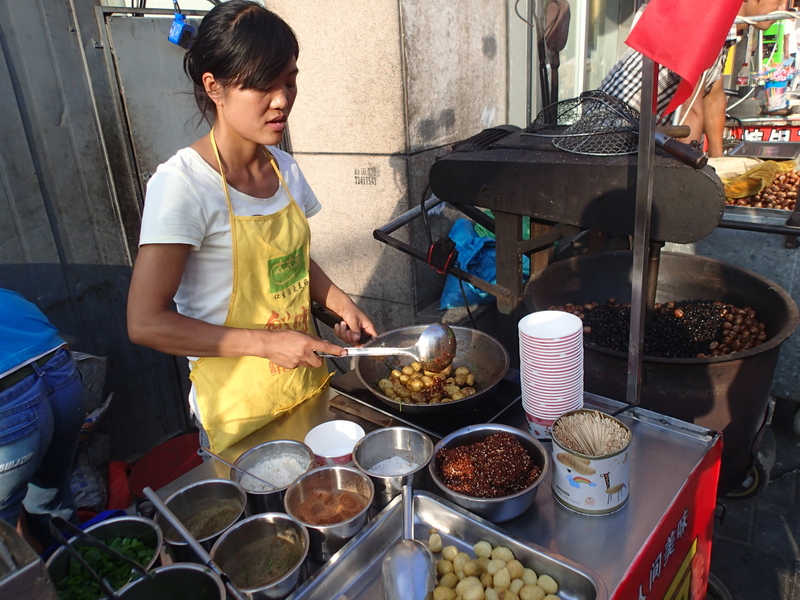 We met our good friend Jillian and immediately set about refueling after the long haul, stopping at almost every street stall we passed on the way to the hostel. 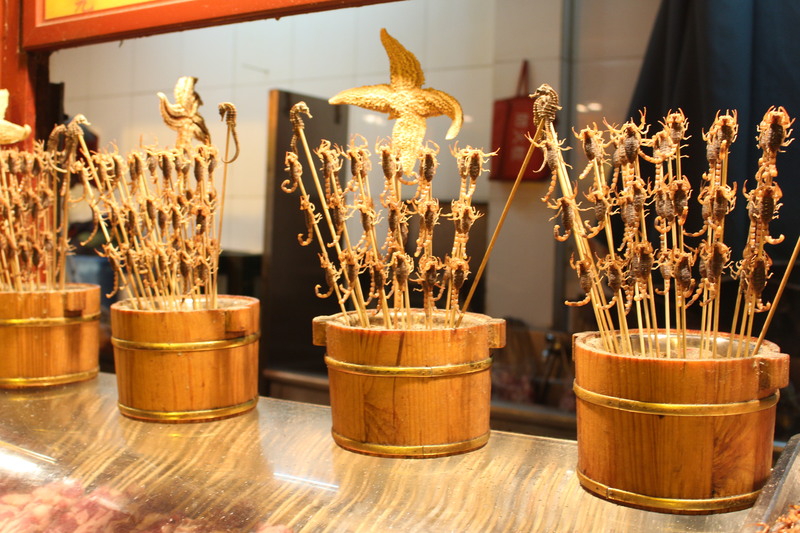 Meat on a stick? Check. Spicy tofu? Check. Fried potatoes? Check? MSG headache? Check. 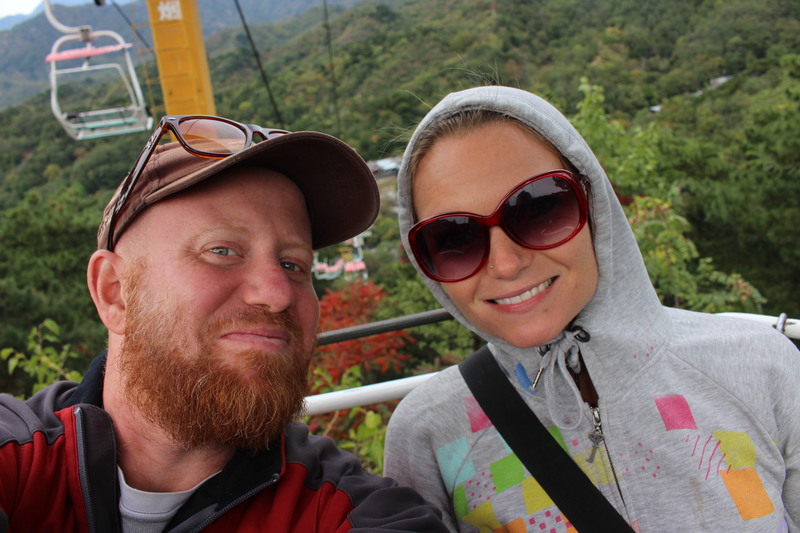 Nepal had been especially great to us. With a developing economy, we had been lucky enough to get wonderful mountain view hotel rooms for $8/night. 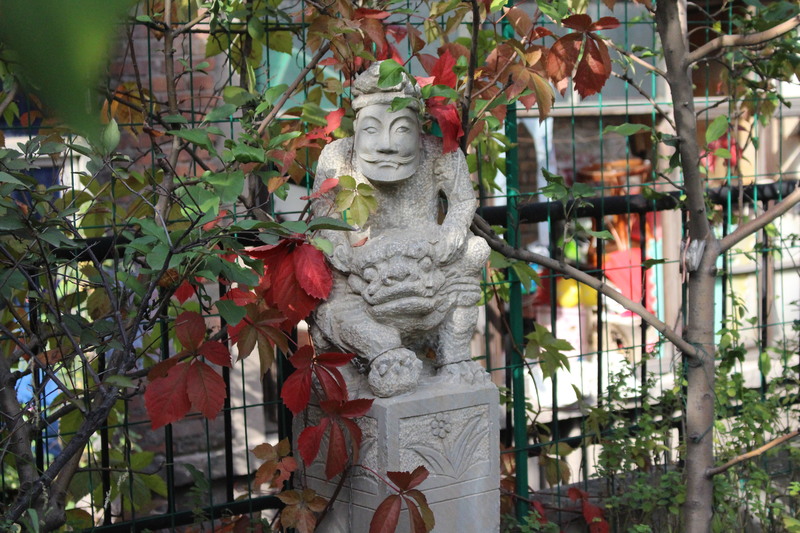 We soon learned that China was a whole different animal. 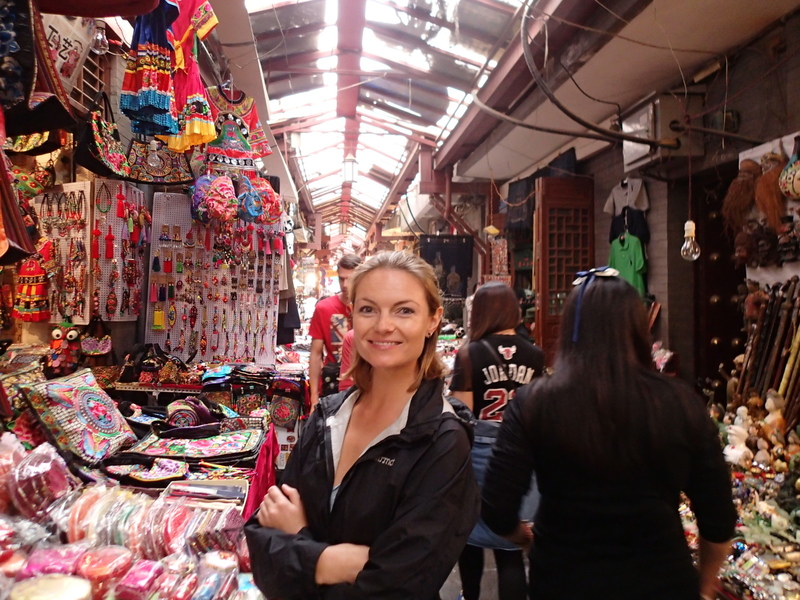 After checking into our $60/night hostel room with wall views, we set about spending several days visiting the markets and sights of beautiful metropolitan Xi’an. 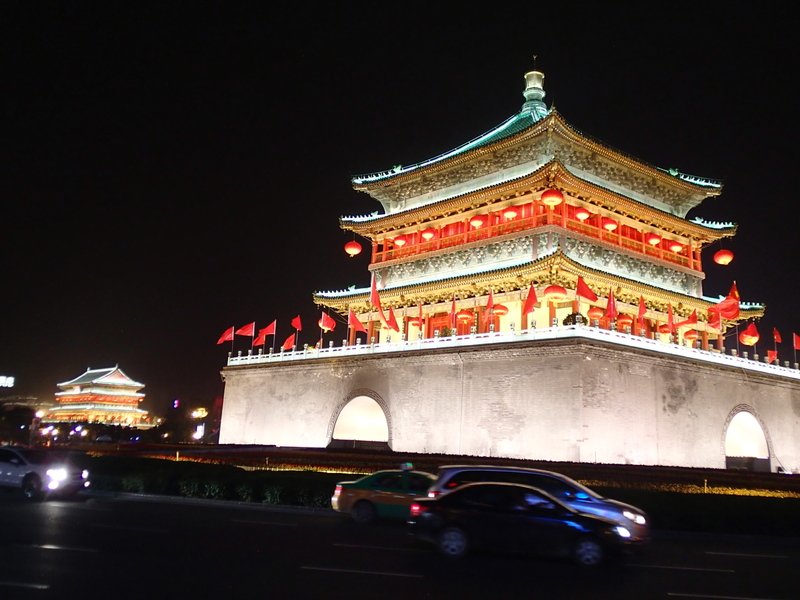 An interesting and modern city, Xi’an was a pleasure to the senses and we enjoyed soaking up the modern culture for a spell before taking our next trip back in time. 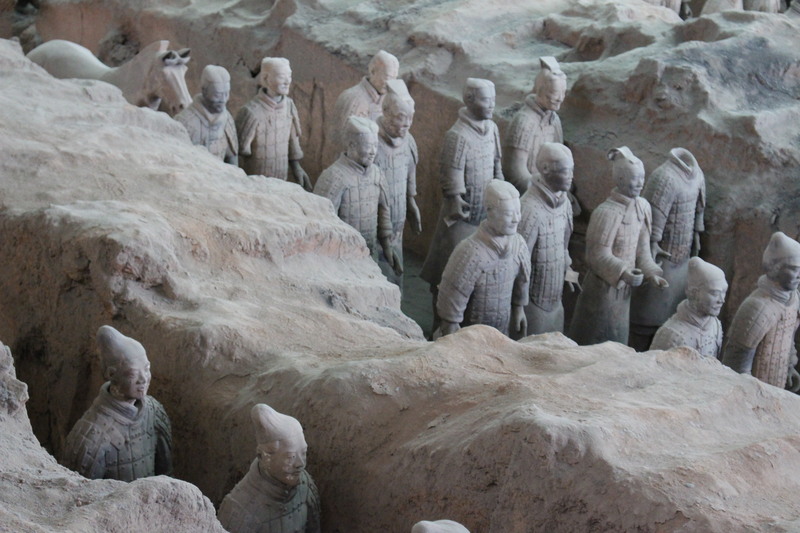 No trip to Xi’an would be complete without a visit to the famous Terracotta Warriors. 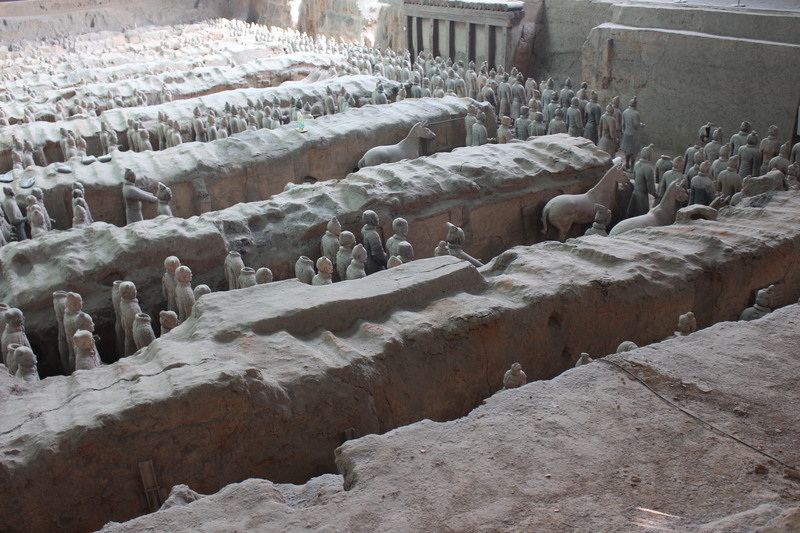 Built in 209 BC by the first emperor of China, Qin Shi Huang, the unbelievable LIFE SIZED statues of 8,000 Warriors, 130 chariots with 520 horses and 150 cavalry were built and then buried to protect the great emperor on his journey into the afterlife. 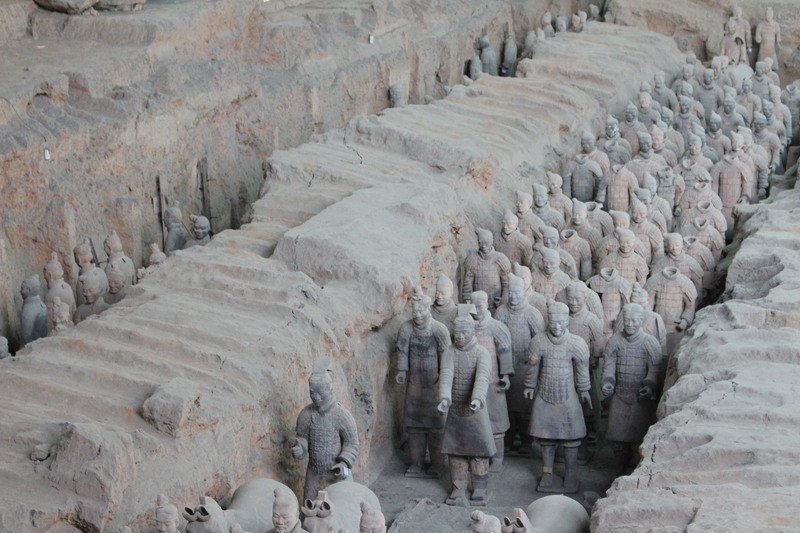 Accidentally discovered by farmers digging a well in 1974, the massive army is one of the greatest archaeological finds of all time. We were excited to see them up close but had no idea what was coming next. 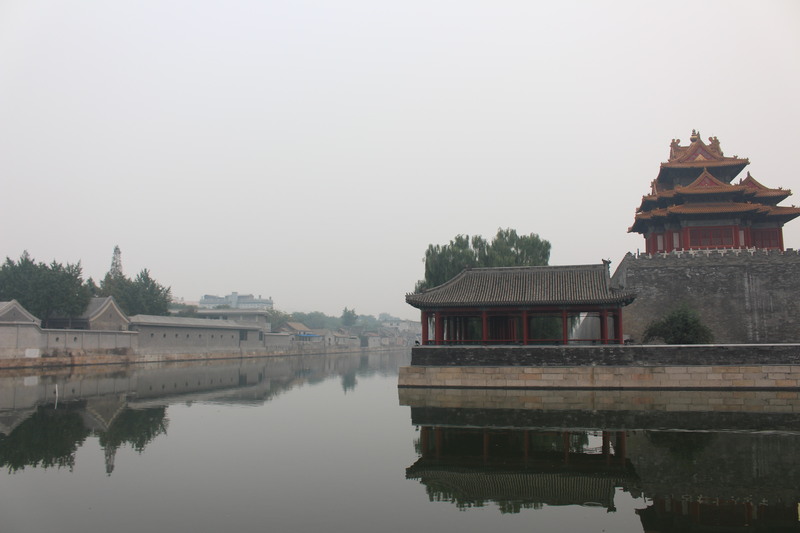 Though we had encountered pushy and loud Chinese tourists throughout our travels, nothing could have prepared us for visiting a Chinese tourist destination on their own soil. It’s kill or be killed out there and we found ourselves routinely shoved, intentionally elbowed and nearly crushed by Chinese tourist of all ilk looking to take pictures. From children to the elderly, it was a free for all unlike anything I’ve ever experienced. We literally had to fight our way to the front of the crowds to take a picture and once there we were yanked and pulled from behind by people trying to take our position. Wow. Really? 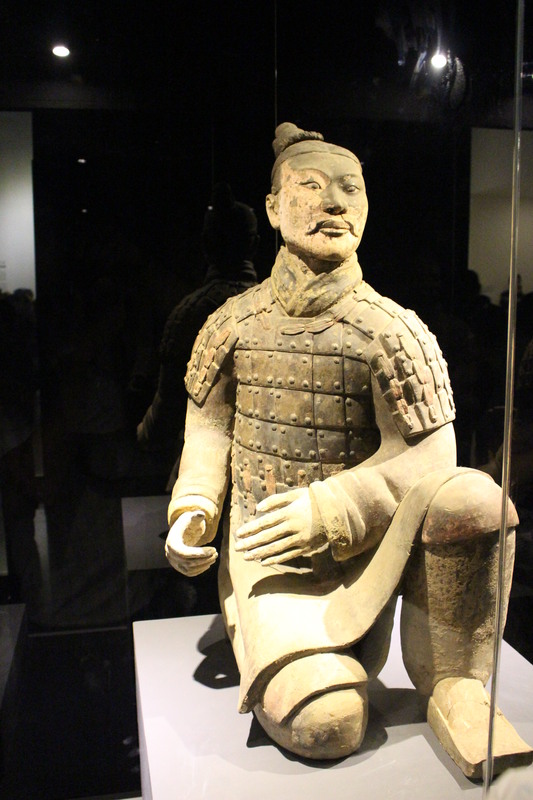 We were also fascinated by the fact that when many of the Chinese tourists finally made it to the front… they didn’t take pictures of the Warriors… they took SELFIES! And not selfies with the warriors behind them mind you, but selfies pointed the other way with the crowd behind them! A picture of them “looking” at the Warriors! So strange. The warriors were incredible. Seeing them is an experience we had craved since having first read about the incredible find decades earlier. But we will most remember our trip (unfortunately?) 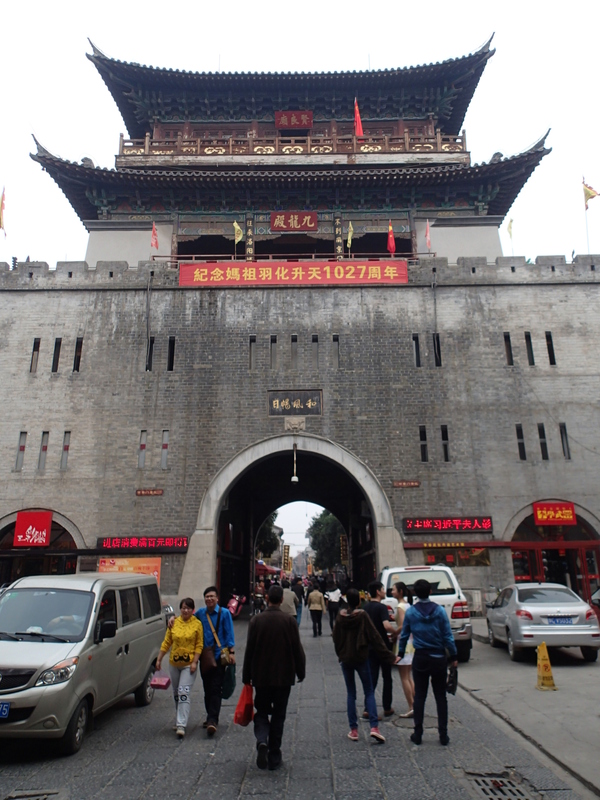 as the place where we got our first glimpse of Chinese tourist culture. Terracotta Warrior time. Brendan Fraser eat your heart out! 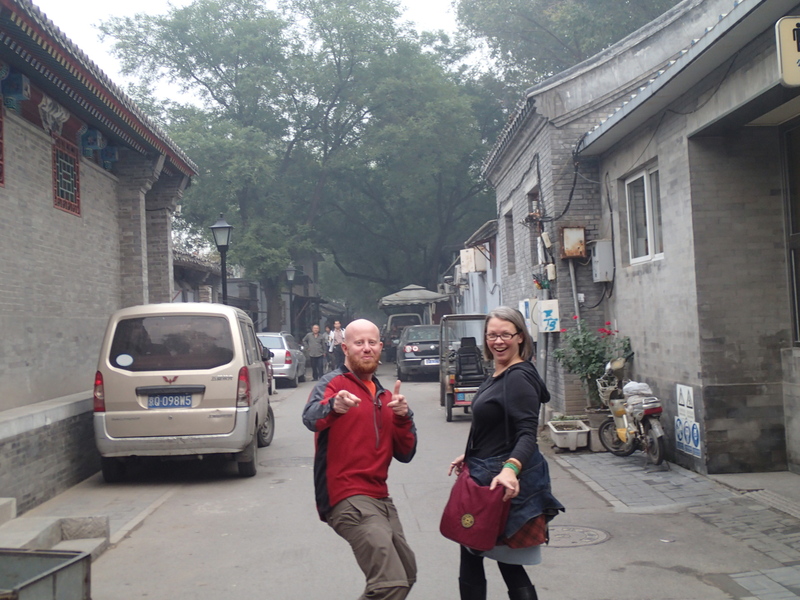 From Xi’an we made our way back to Luoyang and our friend Jillian’s great apartment. We would spend several weeks unwinding after a full year on the road, living out of backpacks and moving every week. It was a wonderful thing. Having a private bedroom. Having a living room. Having a private bathroom. Having laundry. Having reliable wifi. Having a kitchen and the ability to cook. So many things we had done without for so long we had all at once. And it was good. At night we would walk through the public squares and parks of the large city to see where the people gathered every night. 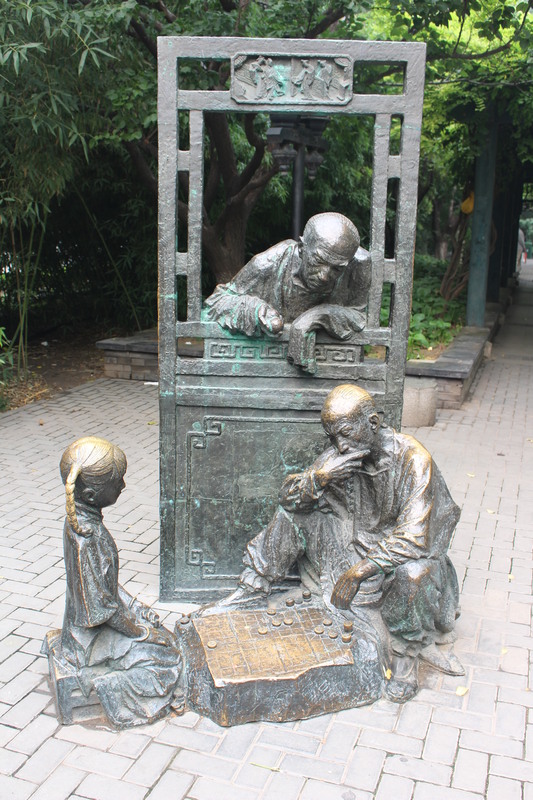 Children played games. People practiced Tai chi. Others practiced sword techniques. Some teenagers breakdanced. Kids rode by in groups on rollerskates. Others practiced calligraphy or interesting string instruments. 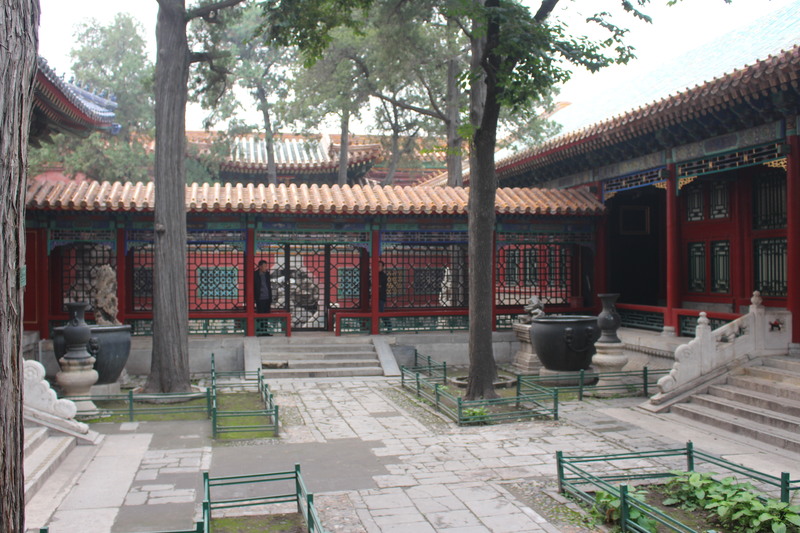 Classical music played as dozens of couples ballroom danced in the center of the large plazas. Every night the residents of the city would gather outside after dinner to have fun together. 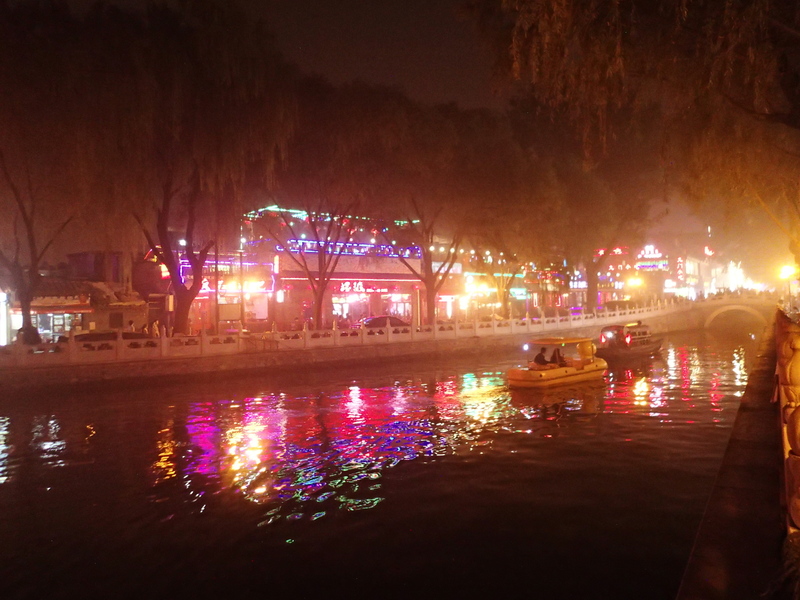 It was a wonderful experience and somehow held a small town charm to it amidst a sea of huge neon lit skyscrapers. 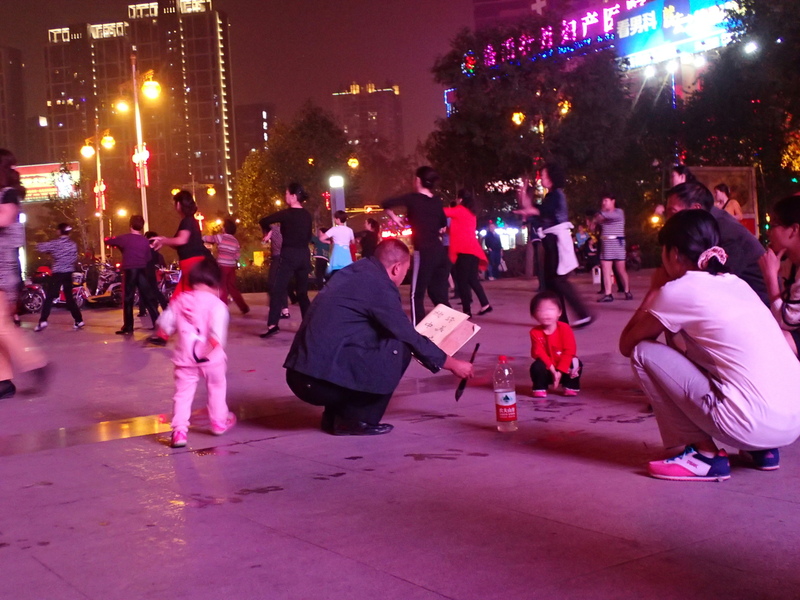 Tai Chi and calligraphy in a Luoyang plaza after dark. 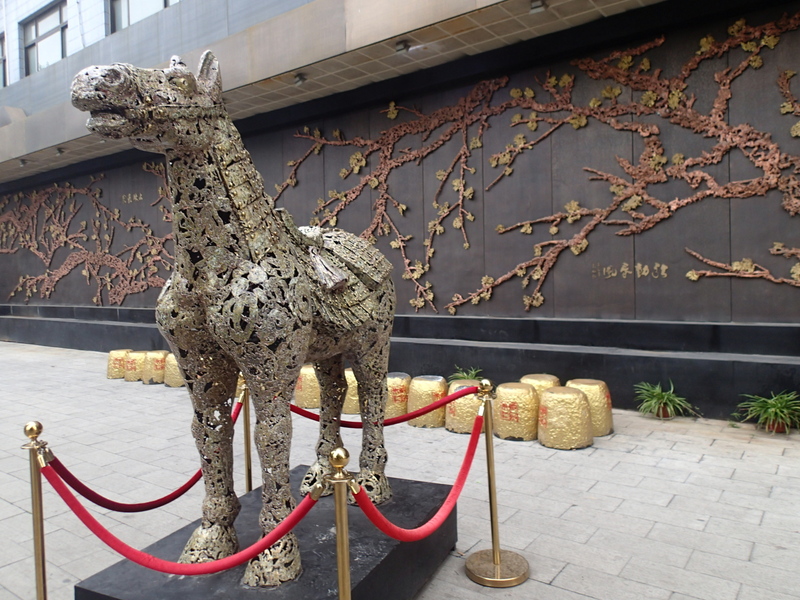 This was one of the greatest things we learned about China. Here, amidst this rapidly growing, technology driven economy, there was a preservation of tradition and community unlike anywhere else we had visited. It was unique in so many ways. 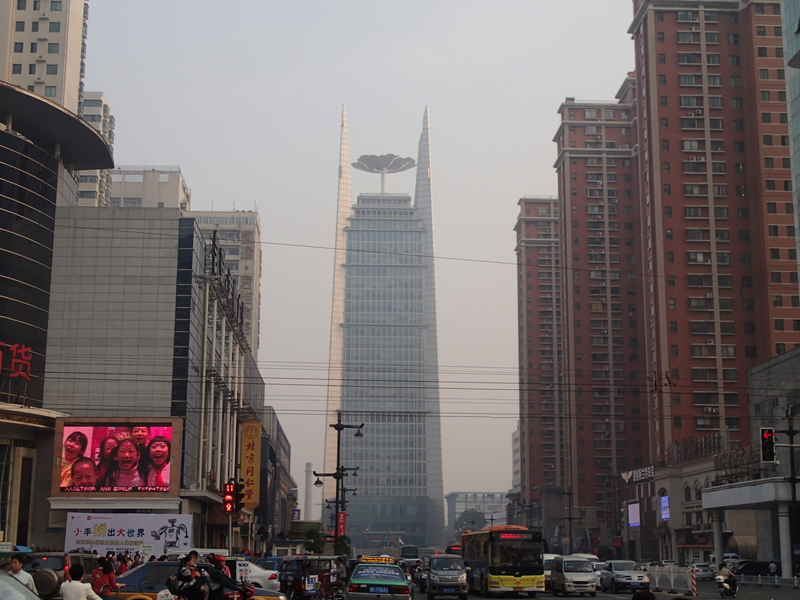 And also very, very smoggy. 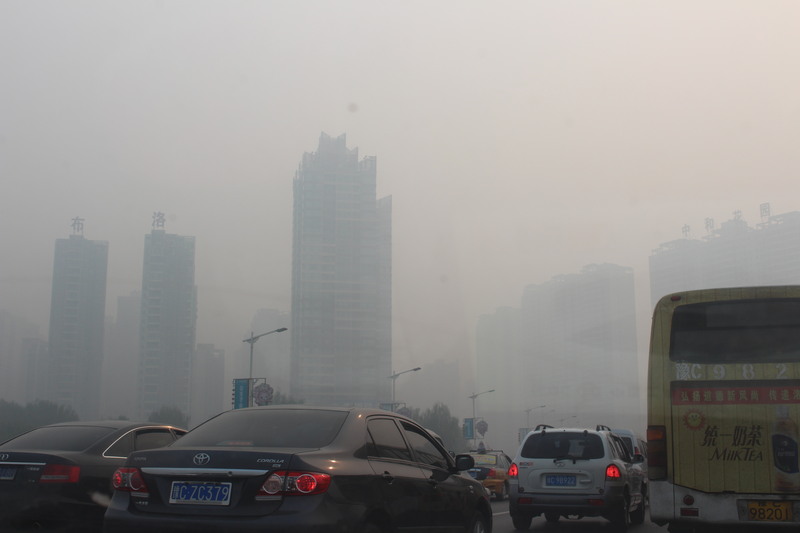 Luoyangs lovely air quality. Off to Beijing! 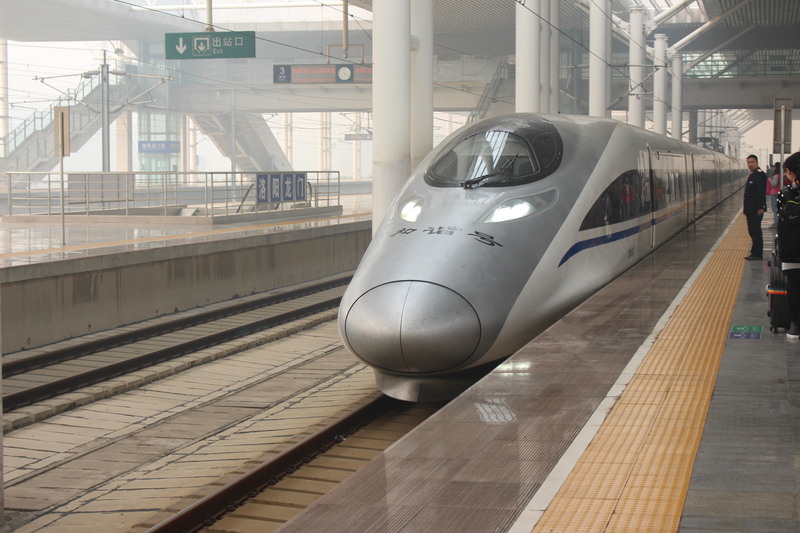 From Luoyang we headed to mighty Beijing. 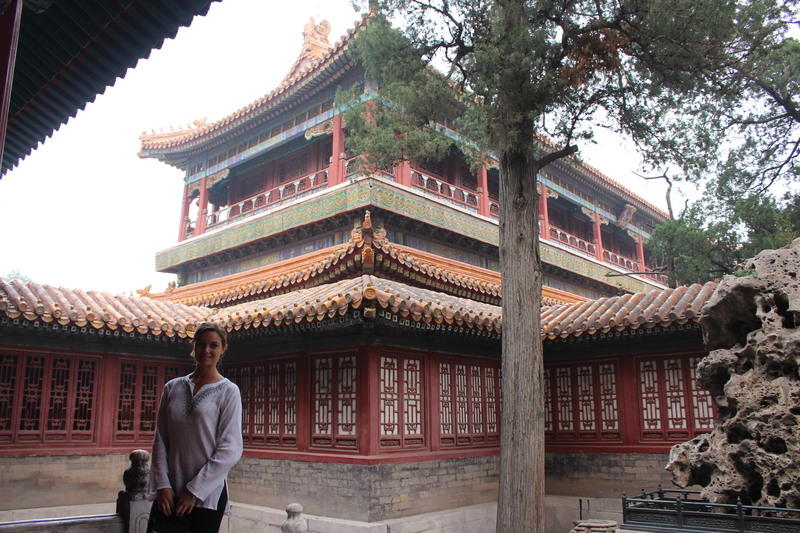 We would spend a week in Beijing soaking up both the history and the modernity of Chinese culture. 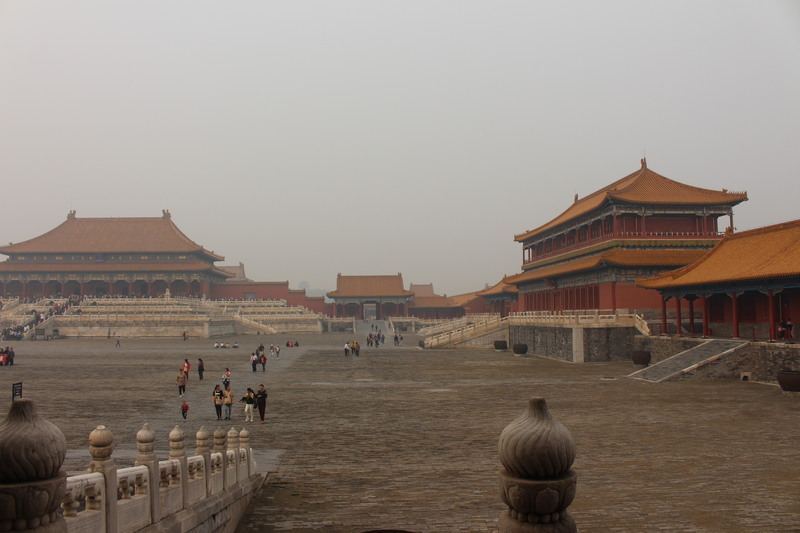 We began our exploration with a visit to the massive and beautiful Forbidden City. 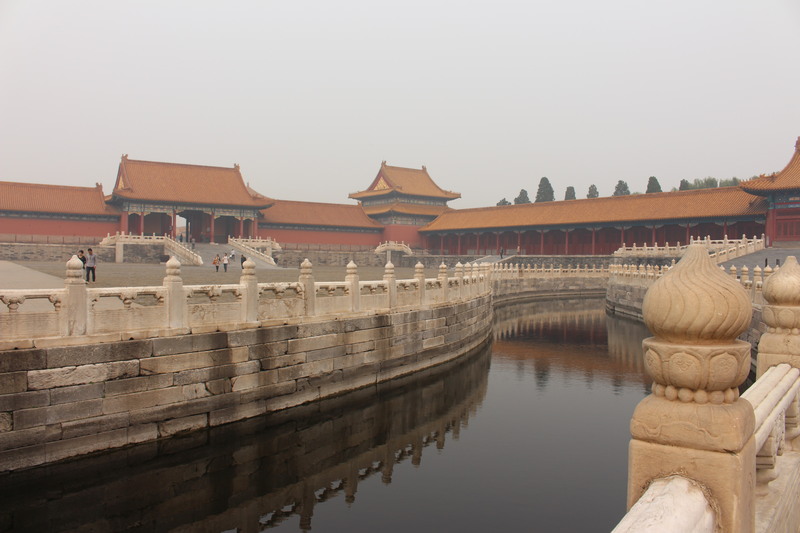 The beautiful walled palaces of the emperors of China for over 500 years from Ming to Qing. 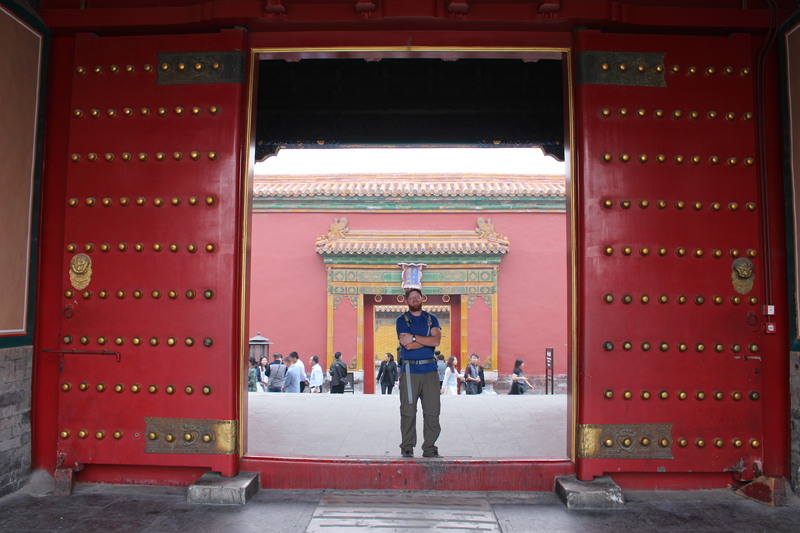 Into the Forbidden City! 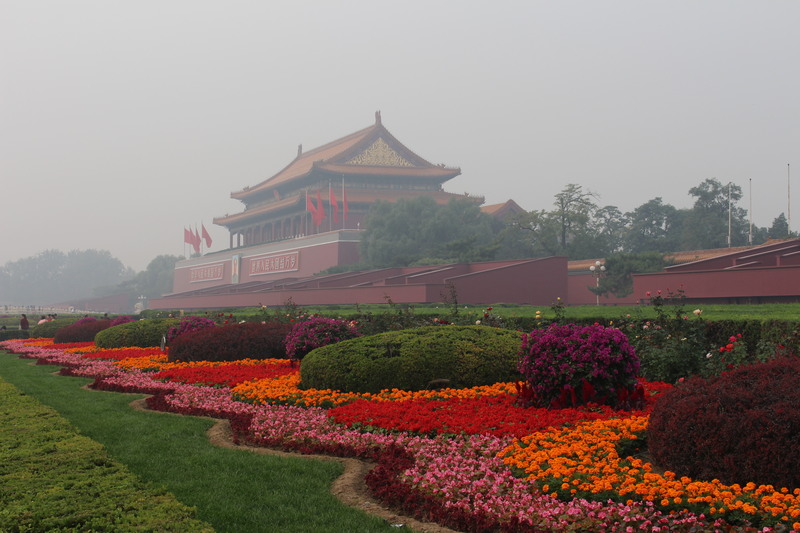 From there we visited the infamous Tiananmen Square. There we learned about its rich and dark history including the protests and subsequent massacre of 1989. 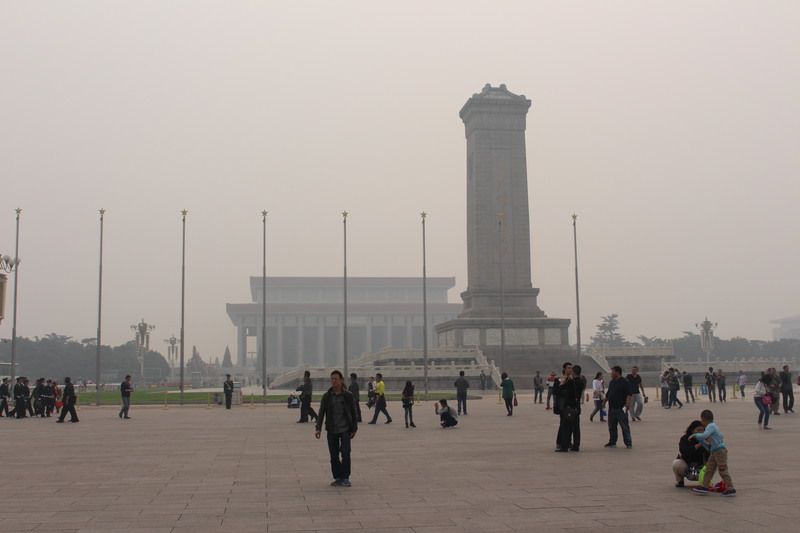 Tiananmen Square today. 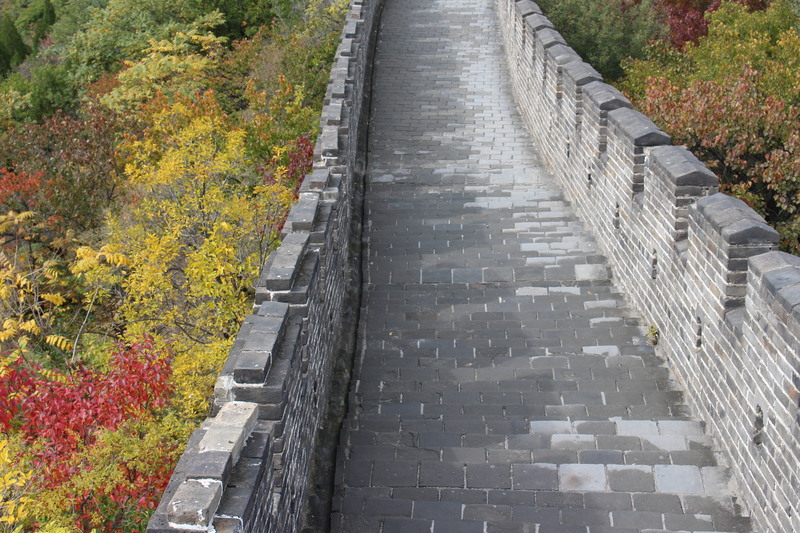 We walked on the Great Wall. 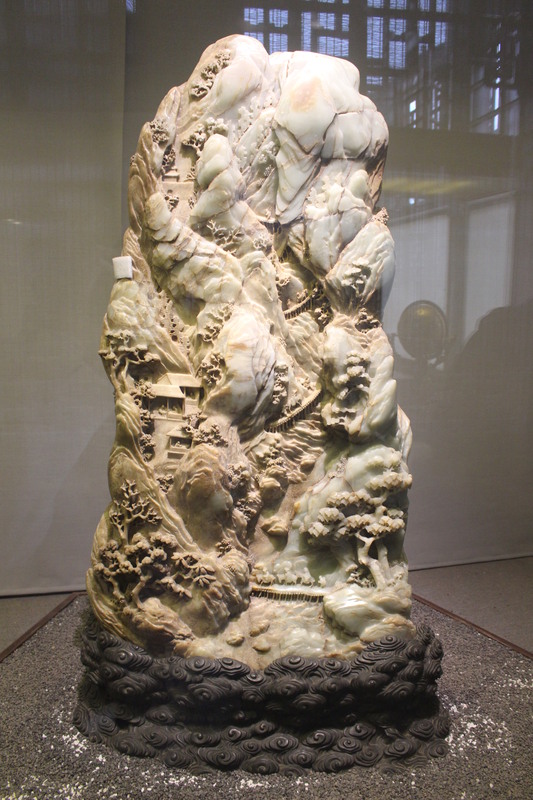 The 5,000 mile long stone and earth barrier built to protect China from Genghis Khans Mongols and the northern hordes. 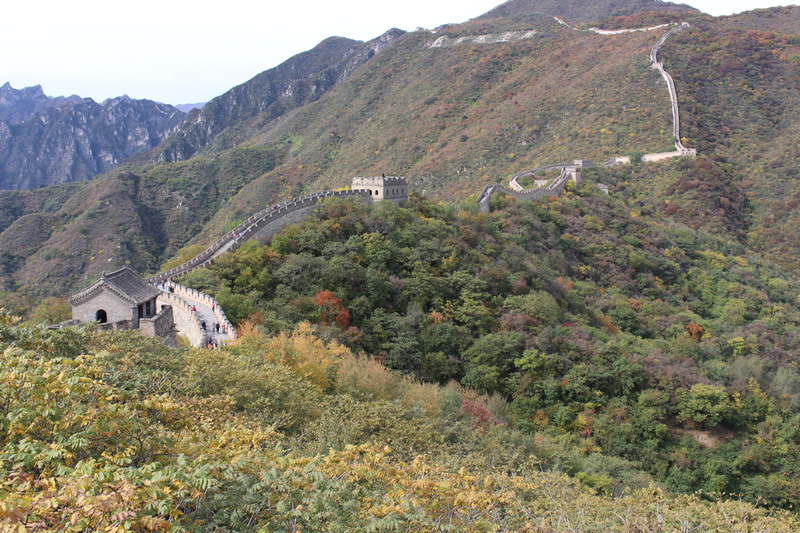 We were nothing but awestruck by its enormity and beauty rolling along the mountainsides. 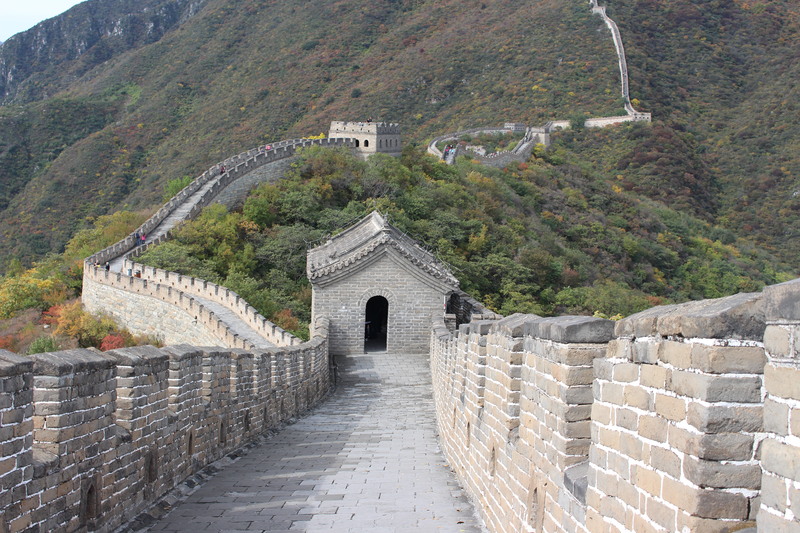 Up we go to the Great Wall! 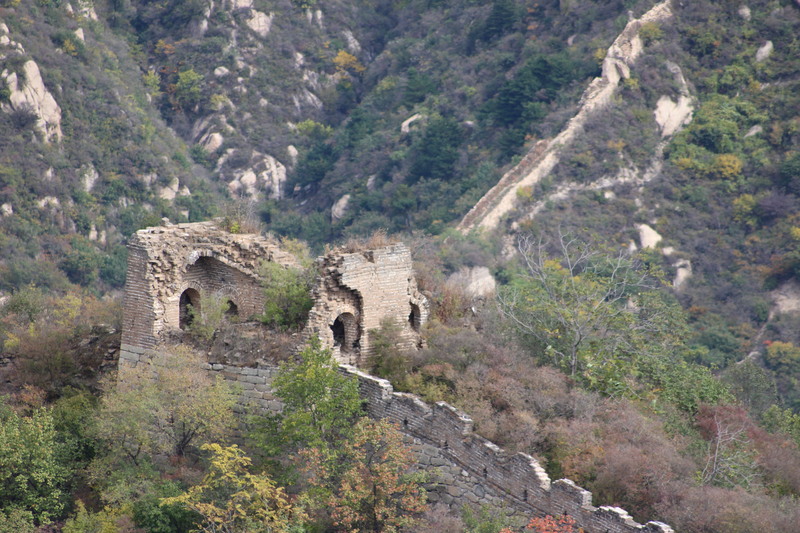 Out for a stroll on an unrestored section of the Wall. 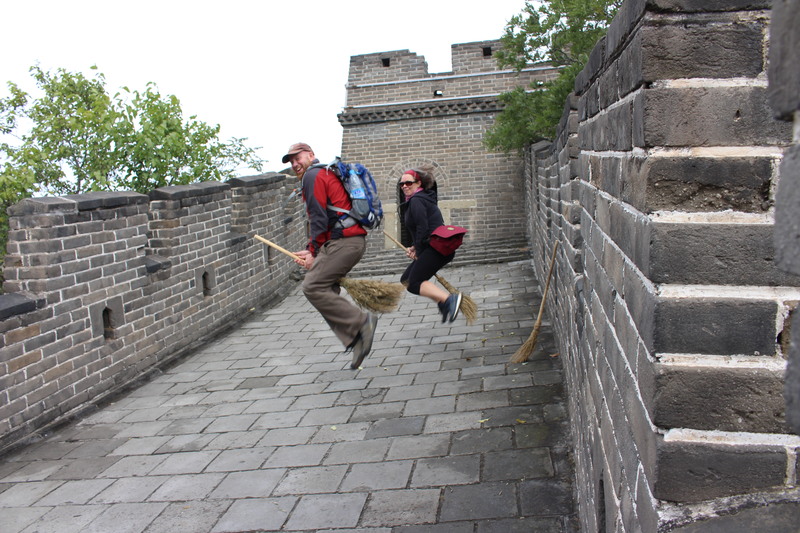 If you’re going to leave old timey straw brooms lying around we gotta take em for a spin. Just, wow. 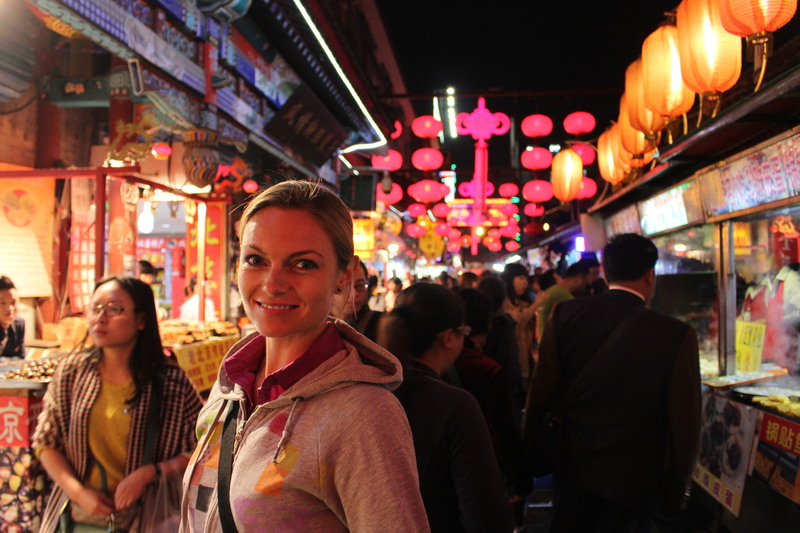 Our next stop would be a trip to the great, crowded night markets of Beijing. 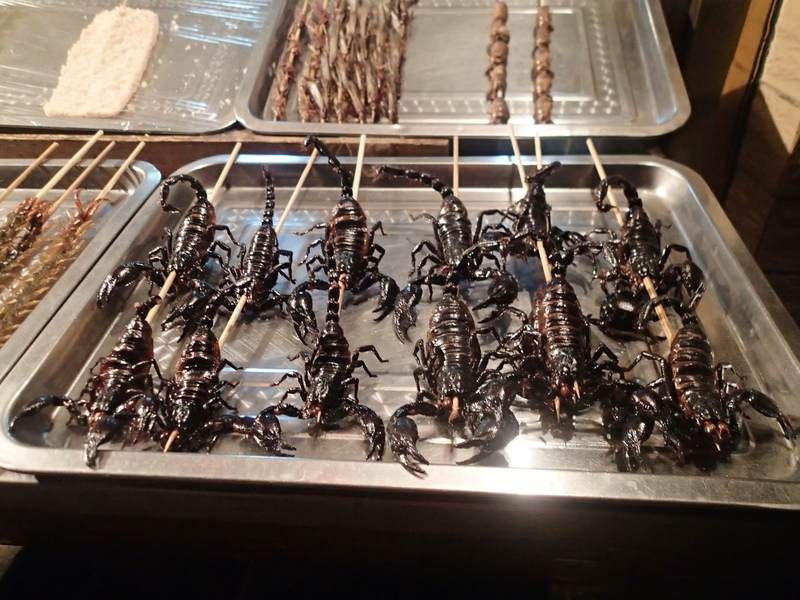 We saw (and sampled) everything from live scorpions on skewers to stinky tofu and more. 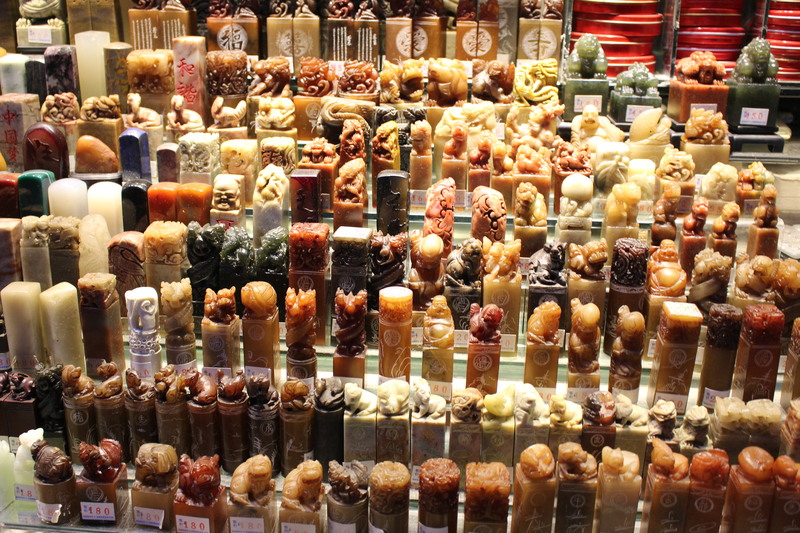 The sights, sounds and smells of the 20 block Beijing night markets is something everyone should experience at some point in their life. 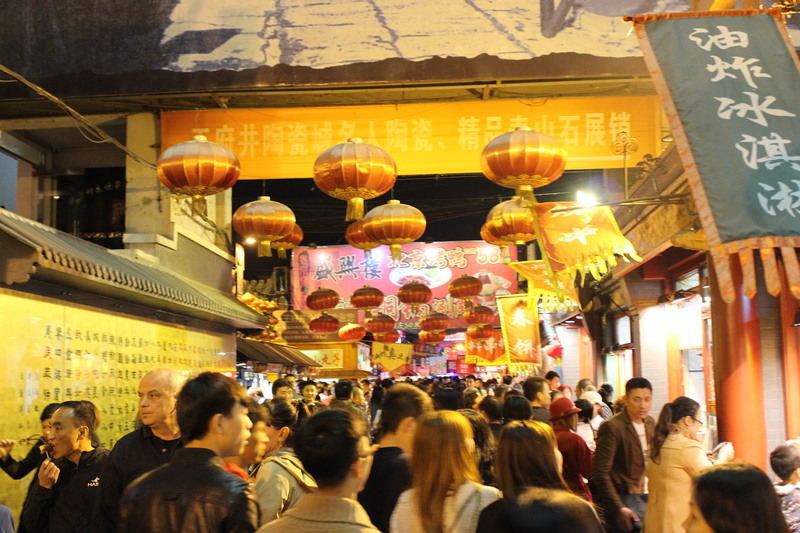 Into the night market we go. 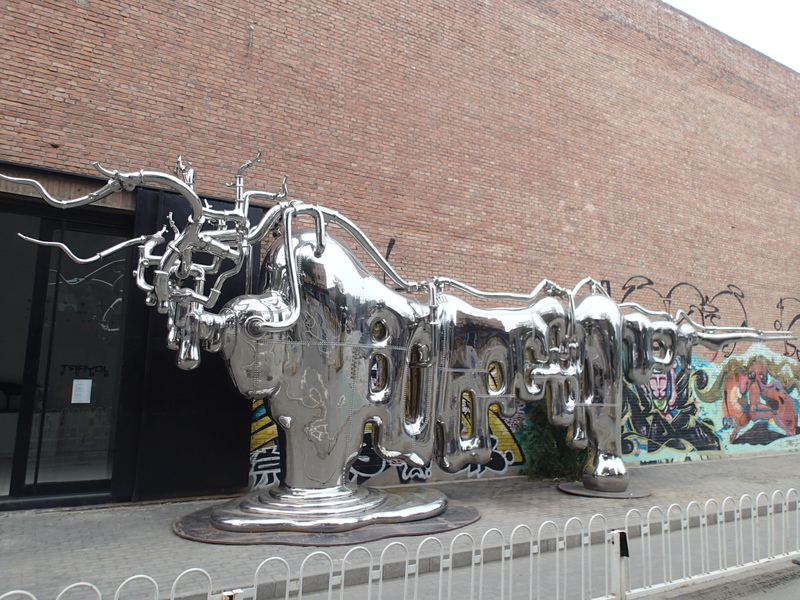 Then, for a look into modern China, we spent an afternoon in the hip, chic 798 Arts District. 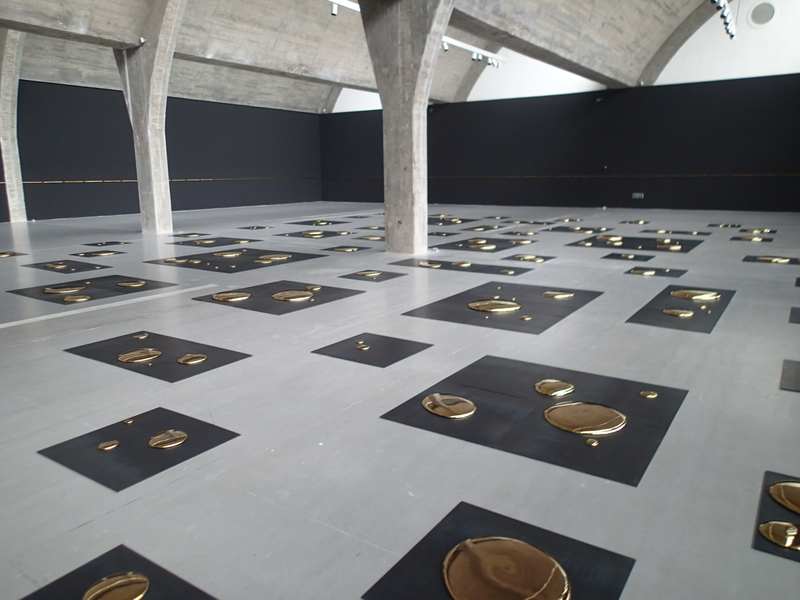 We visited countless galleries throughout the day and got a glimpse of what Chinese modern art is all about. 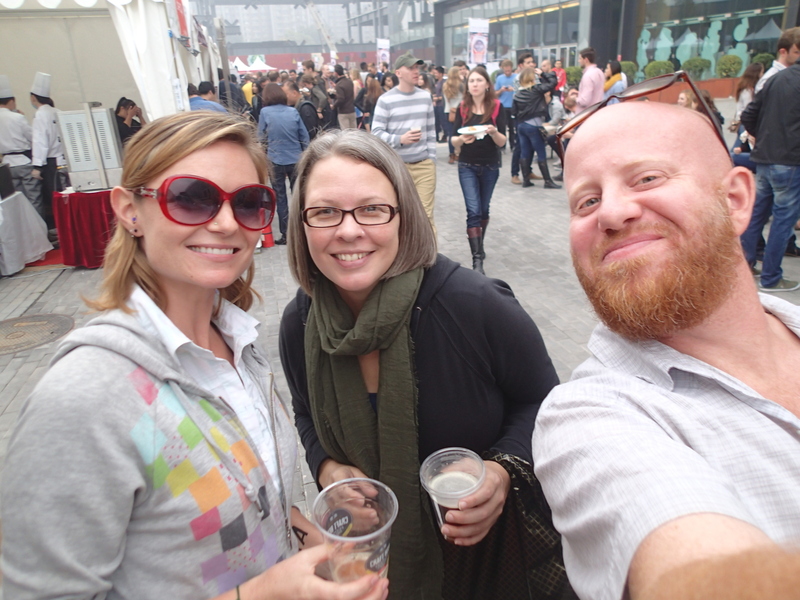 After a stop at a craft beer festival (yes a craft beer festival in China!) 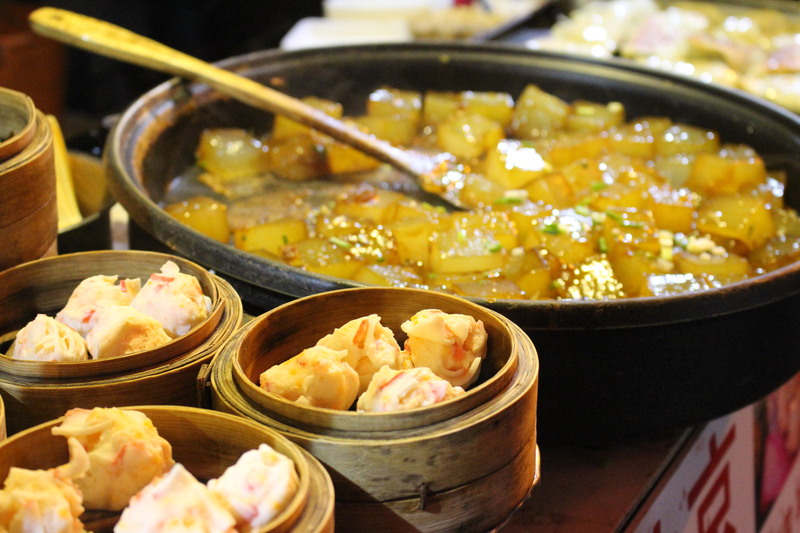 and countless good and greasy Chinese meals, we made our way back to Luoyang to prepare for departure. 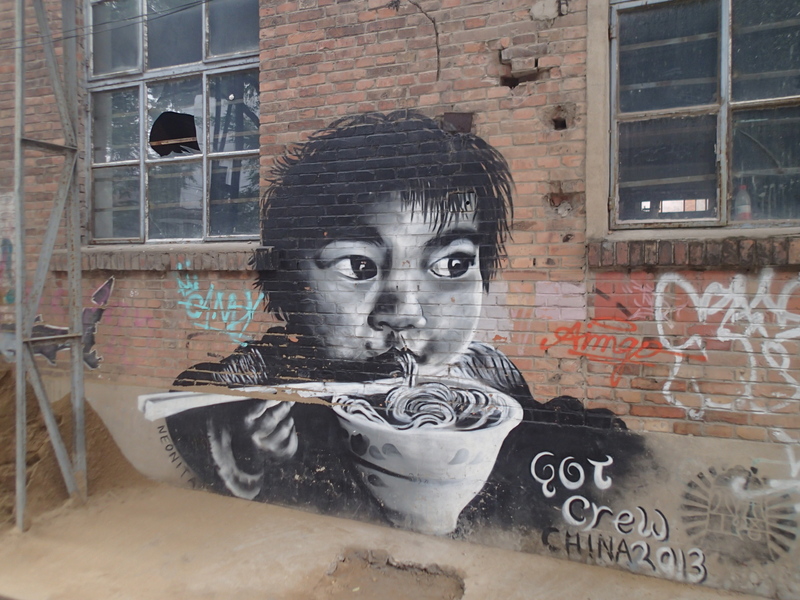 Wandering Beijing. 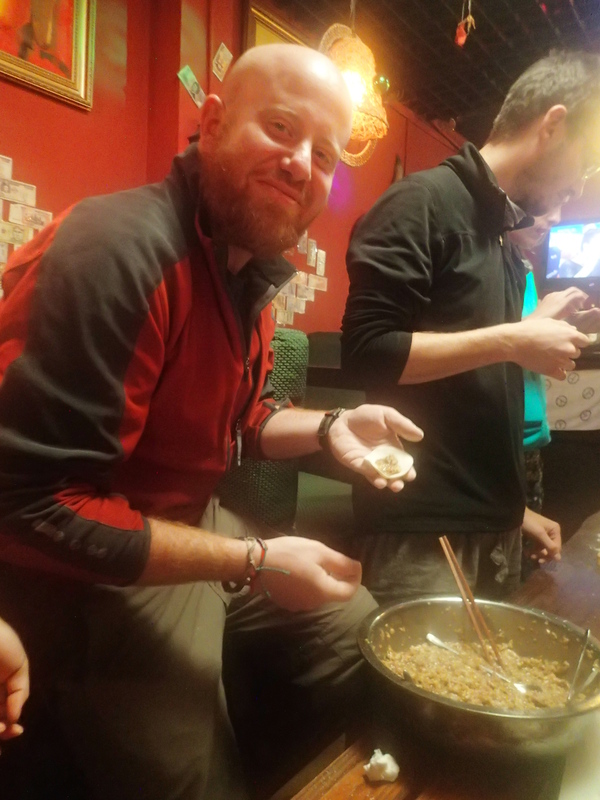 Learning to make dumplings! Jillians favorite burger joint in Beijing. 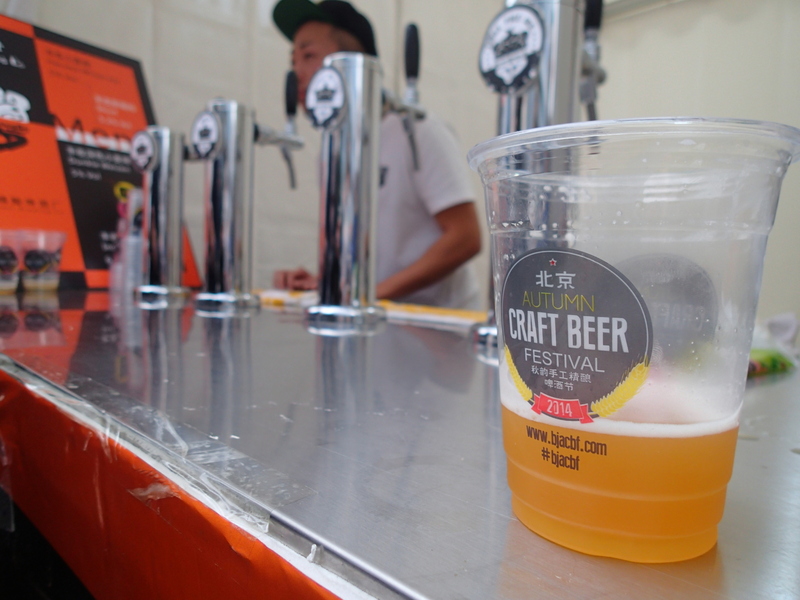 Craft Beer Festival?! Don’t mind if we do! 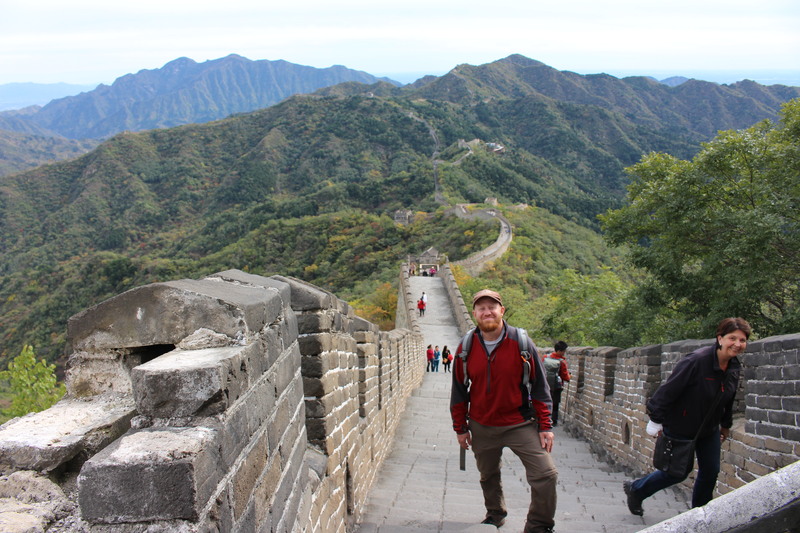 Though we didn’t do nearly as many “sights” as in other countries during our month in China, living there and soaking up the culture and daily life of the place was an amazing experience unto itself. 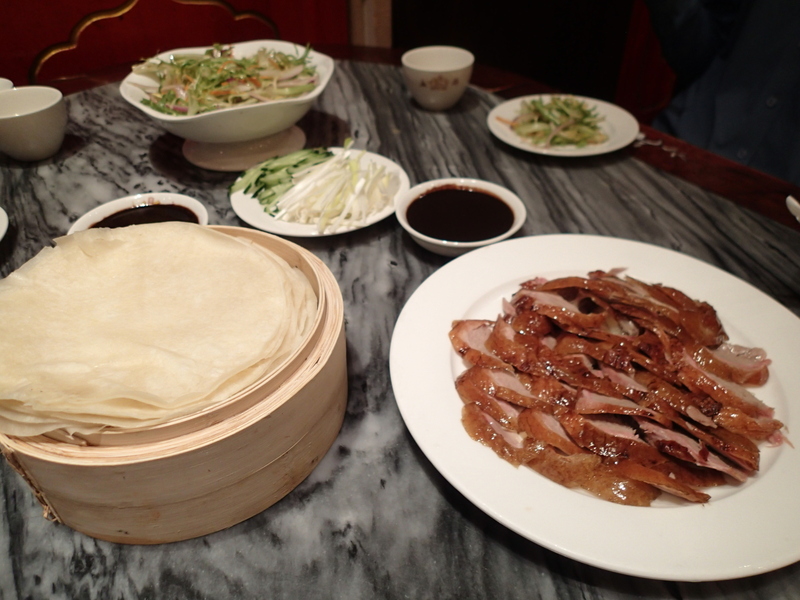 Delicious Peking Duck. Yum! 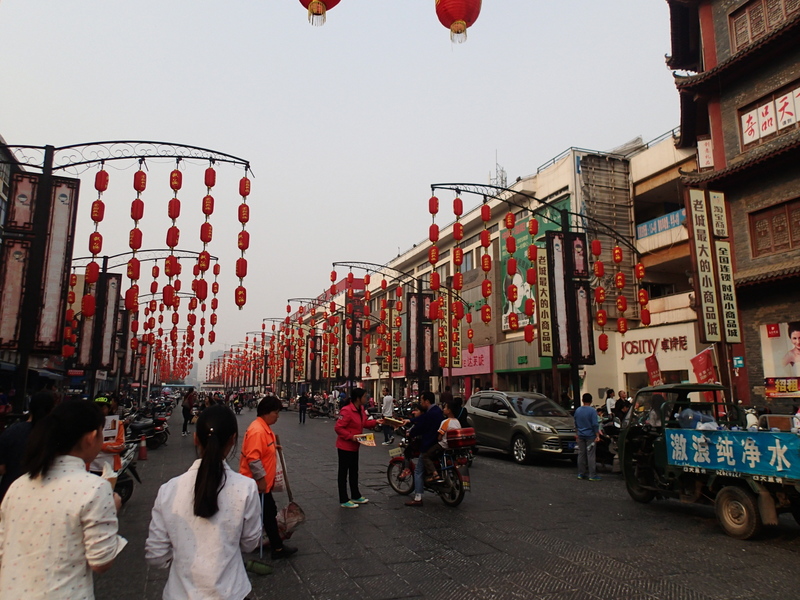 Our next stop would be Taiwan and the small beach town of Hualien. Our friends we had met in a small Himalayan tea house deep in the mountains had told us about it. 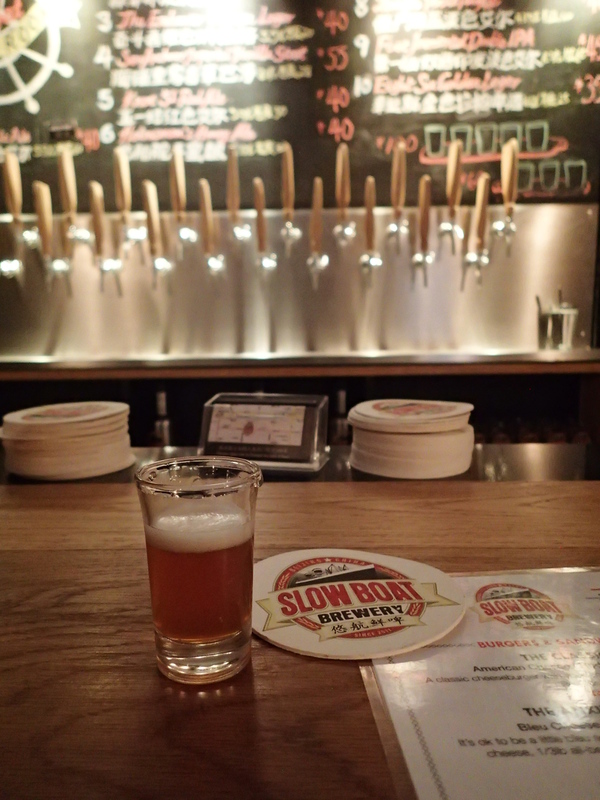 We planned to stop for just a short time…. but if this trip has proved anything, it’s that planning on the road is oh so often nothing more than a fools errand. Awww! What great memories! Excepting the bad air. It’s been so much better lately. I’m missing you both and hoping to catch up soon. Thanks for the recap and the pictures that I’m nabbing. Send more! 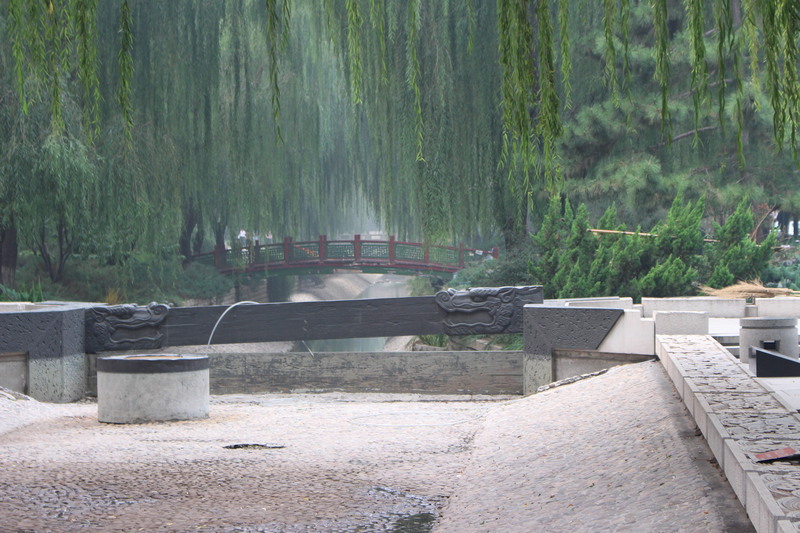 Bob at 75….in all my years (yada,yada, yada) there’s never been anything like your -Dan/Laura’s – road to & thru China. country””) have your special open-eyed wonder – mixed with worldly-savvy. 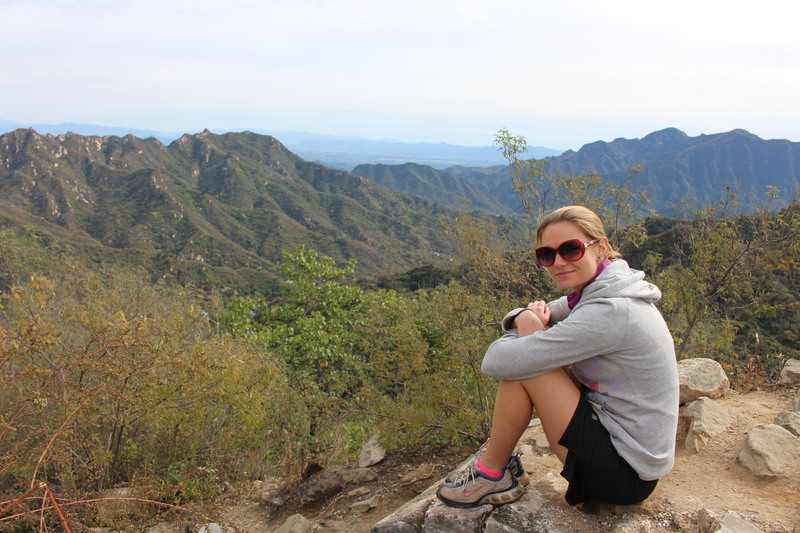 Can’t wait for you to blog away about Taiwan! Awesome stuff. One question: you say something like you went to Tienanmen Square and learned there about the dark history including events of 1989. That surprised me because usually I hear that that history has been repressed inside China, but you are saying there is information about those events there? Was this like official information or stuff you picked up “off the record”? Do people recall it similar to how we heard about it? ← Nepal: From the Jungle to the Mountain Tops.